The increasingly unpredictable weather means you can never be quite sure when you’ll receive heavy snowfall. Make sure you’re ready for when it does fall with our large snow shovel, which will ensure you’re always able to clear the snow and create a walkway outside of your home or work space and keep your life running smoothly. This large shovel has been made extra wide so you’re able to clear more snow at once, which will make the job light work no matter how much snow has fallen. The injection-moulded thermoplastic is also super light, weighing just 1.9 kg, so your arms won’t get tired if it’s a big job. The high-quality material is virtually unbreakable too, so you don’t need to worry about hitting the hard ice underneath the snow. The shovel is made with the harsh conditions of winter in mind. 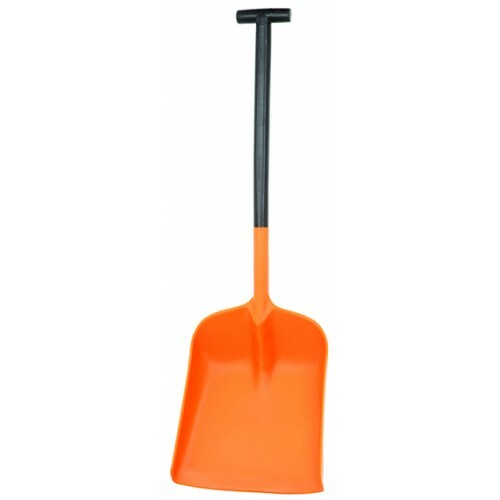 It’s able to handle extreme temperatures, all the way down to -30C (and up to a sweltering +80C), but it’s also coloured in such a way that it’ll stand out in snowy conditions - the top half of the shovel is black while the bottom half is an eye-catching orange. When you get to work, the shovel will help you clear the snow quickly and let you back to your busy day. Made from non-stick material, the snow will easily slide off once it’s been moved elsewhere. This will help save you time and ensure you don’t need to spend any longer than necessary making your business premises accessible. 30kg High Output SaltSpreader ••30kg hopper capacity constructed from rust proof poly ••Ligh..
36kg Professional Spreader With unique agitation at point of delivery for complete hopper em..
18kg Spreader Our most popular spreader due to its ease of use and durability. • 18kg ..
White De-Icing Salt Highest purity salt for de-icing snow and ice. • Ideal for quick d.. Heavy Duty Snow Shovel With its deep cavity blade reinforced with a strong steel wear strip, th.. Snow Pusher Unbreakable snow shovel Fits in the boot of almost any car Makes light work of he..